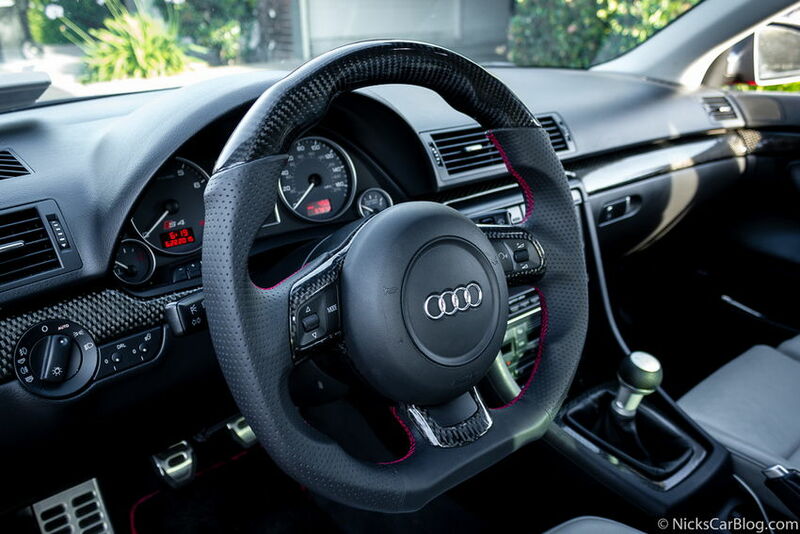 I was recently contacted by a company in Southern California that specializes in custom steering wheels called DCTMS to try out their top-of-the-line carbon fiber R8 V10 flat bottom steering wheel conversion. Despite already having a flat bottom steering wheel, I couldn’t say no to adding more carbon fiber. After receiving my new wheel within days of ordering, I was so blown away by the quality and finish of the wheel that I not only bought one, but I am now setup as an affiliate to sell these steering wheels to any readers who may be interested at a discounted rate! This wheel will fit on virtually any newer Audi from 2006 onward, but was originally designed for the A3, TT, or R8. If you have one of these cars, or a variant thereof (e.g. TT-RS, S3, etc. ), then you simply can reuse your existing airbag and steering wheel trim piece and installation will be plug and play. 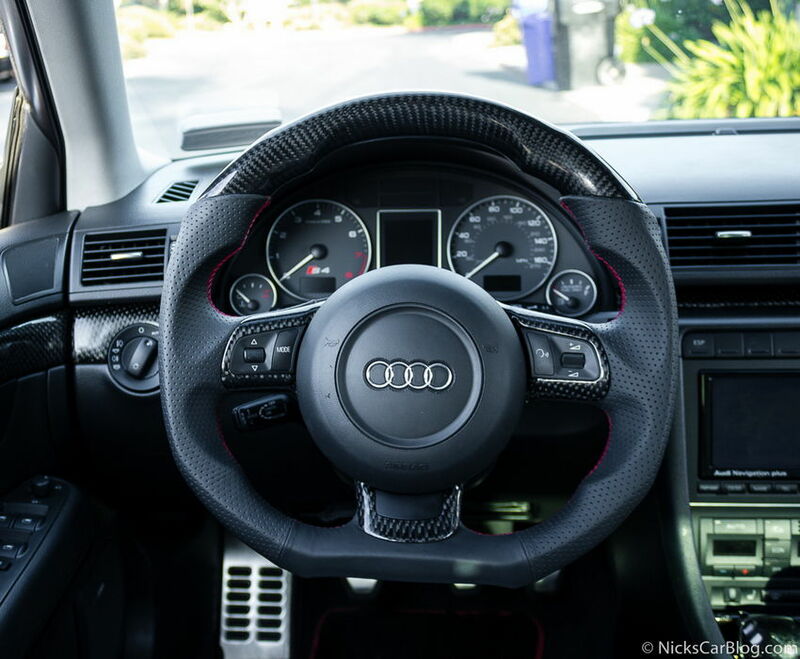 If you have an A4/S4, or any other car without a round steering wheel, then you’ll need to buy a new airbag, and may need to make a minor modification to the wiring harness to get it to work properly as you would with any flat bottom wheel conversion. If you have a B6 or earlier model, then this wheel probably won’t work for you given the different wiring systems of the airbag; however, DCTMS can refinish your existing wheel to make it nicer, including adding a flat bottom, thicker materials, air leather, alcantara, carbon fiber, or other options – so contact them if you don’t think your car is compatible with the R8/TT wheel but you still want something special to enhance your interior. Purchasing a new airbag and trim piece is a bit expensive, just to warn you. The airbags generally run around $500-600 used (and over $1k new). You can sometimes find them on eBay, or order through a site like Europrice.us or your local Audi dealer. The wheel pictured costs $1,199.99 new and comes with a carbon fiber top, red stitching, and perforated air leather with enhanced grips. If you wish to customize the wheel such as using alcantara, different colored stitching, a centering line, or other options, this can be accommodated for an additional cost and a 4-6 week lead time. You can check out their Facebook gallery for more examples of this wheel in different finishes. DCTMS has been kind enough to offer readers of my blog a discount on this product, so contact me to arrange a quote and they will ship the wheel directly to you. You may also contact them directly if you’d like at sales@dctms.com. Contact Me for a Discount! You can check out their Instagram and Facebook for recent projects, but as you can see they make custom steering wheels for all sorts of models including Porsche, Mercedes, Lamborghini, and Ferrari. 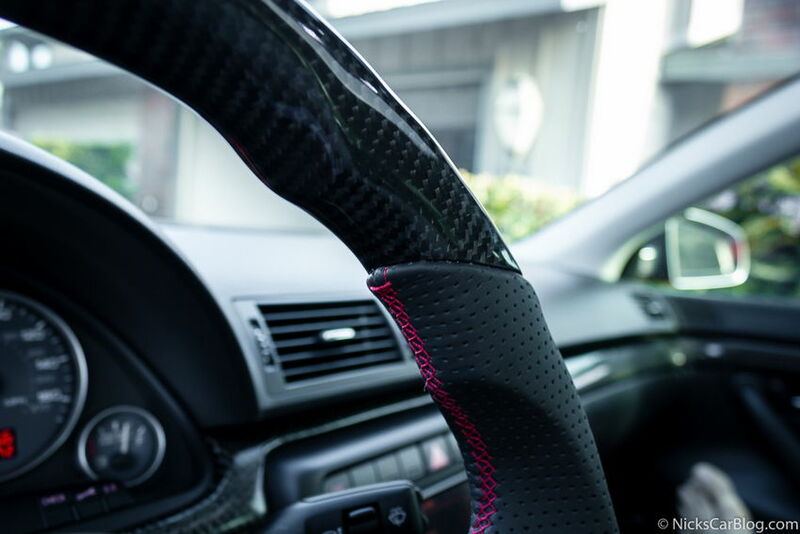 If you just want your current steering wheel rewrapped to add alcantara or restore to original condition, they can do that too. That steering wheel looks incredible! Any worries setting up the new airbag? I have a B7 A4 and would have to go from the stock trapezoidal to the R8/TT round style. I love the looks, but obviously I would want to be dead sure the air bag would still work as designed. Hey Josh – for the new airbag I actually bought a wiring harness from Europrice so it was plug and play without splicing any wires. Plenty of have just DIY’d it without the harness though, so it’s totally up to you. I haven’t had any problems with the airbag swap, no warning lights, etc. Your interior is the most perfect thing I’ve ever seen. I feel as if the wheel looks too “batmobile-y”. I haven’t checked yet, but do they offer a more OEM looking flat-bottomed wheel? I have the standard ’05 B7 S4 round wheel with the center that mimics the front grille, which I love. But what I’m really looking for is a wheel like mine with a flat-bottom (and satin aluminum finish). If I can’t find one, I have actually thought about smelting my own aluminum to make one from scratch!